Can The Volvo V90 Cross Country Make Your Rally Dreams Come True? 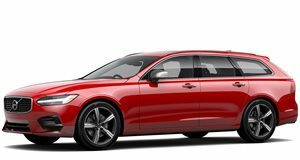 It's more than just a jacked-up V90 wagon. Before the crossover, SUV and minivan, it was the station wagon that carted families around town and on road trips long and short. But trends change and only a few years ago the wagon was nearly written off completely. Volvo, however, still kept the faith and the result is the V90, sister of the S90 luxury sedan. Thing is, there are still plenty of American buyers, mostly men, who simply can’t bring themselves to buy a wagon over an SUV. Call it machoism, call it fear of trying something new, whatever. Point being is that wagons offer nearly (if not more) storage space of an SUV/crossover and better fuel economy. But Volvo didn’t want to take any chances with the V90, so it launched the V90 Cross Country. It’s more than just a jacked-up V90, as Motor Trend’s Randy Pobst happily points out. Volvo spent serious time and money developing this AWD system, and its off-roading capabilities speak for themselves. Yes, there is some additional body cladding, but we think it suits the V90 just fine. It’s a bit more rugged-looking while also retaining that sleek Scandinavian styling. Is it Jeep-like off-road? Not really, but then again, the V90 CC not only impressed Pobst but also a pro rally driver.